Due to previous technical difficulties, Synchronized Chaos Magazine’s March 2015 issue will go live Monday, March 2nd. Thank you for your patience! Welcome, readers, to February’s issue of Synchronized Chaos International Magazine. 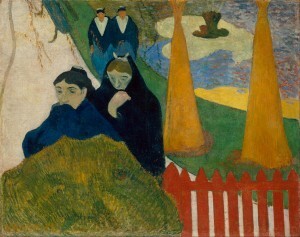 This month, perhaps in line with a certain view of the Valentine’s Day holiday, we turn to themes of loss and longing. Elizabeth Hughes brings us reviews of several horror, thriller, fantasy and suspense novels in her Book Periscope column: Michael de la Pena’s FBI covert action thriller Coyote Wars, Marjorie Thelen’s utopian spoof of old-fashioned campy sci fi, A Far Out Galaxy, and Bobby Sutton’s Cajun horror tale Reunion: The Making of a Legend. What sorts of psychological longings are addressed by horror and thriller novels? Why do these genres continue to appeal to readers? Our colleague Merrick Hansen, in an interview with Bobby Sutton that we hope to reprint, suggests that horror appeals to our primal instincts, gets our attention and makes us feel something and remember that we are alive. I and others see in these genres a way to experience intense feelings in a safe, vicarious environment. 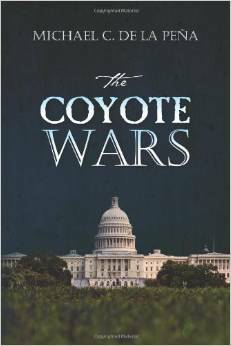 When my life is calm, I find myself enjoying something bolder and rougher, such as Coyote Wars or Reunion. When things become more chaotic, I seek out something more akin to A Far Out Galaxy, which contains plenty of action and suspense but affirms the power of love and connection. As much as some people make fun of ‘campy’ writing or pieces with happy endings, the fact is that books of this sort remain popular, in part because people seek out some basic order to the universe, some sense that even setbacks are part of a larger story that will eventually make sense. Brian Sutton points out that even horror is not necessarily nihilistic and can point to moral order without a requisite happy ending when seen as illustrating the ugliness and dangers of evil. 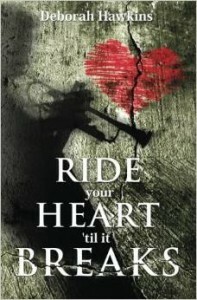 Elizabeth Hughes also reviews Deborah Hawkins’ Ride Your Heart ‘Til it Breaks, a literary romance whose characters grapple and choose among a variety of desires: for meaningful careers, stable relationships, passion, and finding their true selves. Hawkins explores forgiveness and self-discovery as ways to make peace with our past losses and present choices in her tale of an undying connection between a musician and a lawyer. Some poets this issue express different sorts of longings. James Brush goes back to earlier poetic forms to convey something even more primal: the need for rain. Brush seeks out a more elemental, real connection to nature, to something visual and visceral. G.K. Brannen also speaks of harmony with nature, with the water and desert, in an authentic, tough-minded way. Just as Brush and Brannen encourage us to look outward and pay attention to our physical world, columnist Ryan Hodge looks to the ecosystem of video games to illustrate how much we can learn about our surroundings and how much of a story we can put together through careful observation. Peter Jacob Streitz’ work laments that he never became bold and uncompromising enough in the quest for good, a piece inspired by the life of Martin Luther King. K.C Fontaine also experiences a death of some of his idealism, as what he considers a worthy nonprofit turns out to be marred by systemic arrogance. Marjorie Thelen also fantasizes about expanding the possibilities of her life, envisioning different destinies in a more fanciful piece. J. Lewis’ poetry illustrates grief in a piece inspired by the attack on the World Trade Center but intended to become more universal. 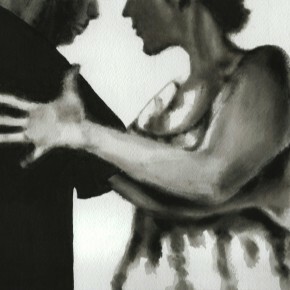 Jordana Feld’s tango-inspired artwork celebrates a dance embodying longing and desire. Arron Erickson cries out through poetry for a fairer world where there is recognition of activities less popular that competitive sports. Paul Beckman’s flash fiction piece shows how a man’s behavior leads to disappointment and loss in his life. Alan Clinton’s quirky travel vignettes include lots of cultural references, from 90’s band Oasis to Babylonian temple customs. In this way his speaker seeks to be part of history, part of the global pantheon of culture. Ross Bryant plays with words, tantalizing us with a plethora of language that stimulates our desire to communicate and be heard. Andrea Carr’s novel Family Tree the Novel: Family Tree’s protagonist Angel Harper longs for a family without secrets. In this novel, reviewed by Tony Longshanks leTigre, the loss of Angel’s sister drives her to reconnect with relatives and push for this level of wholeness. Sue W-D’s poetic vignettes are suffused with intimacy and memory, and provide us with pleasing glimpses of her cat. This issue’s collection of Nigerian-inspired fables from Laura Kaminski are meditations on thought, awareness, and gratitude. Virginie Colline renders death in a poetic stylized manner, perhaps finding beauty in the pain of loss, or softening it through art. And Christopher Bernard grapples with the killings of cartoonists at the Charlie Hebdo magazine through the medium of cartoons. Thank you very much for considering the thoughts and works of this month’s contributors. 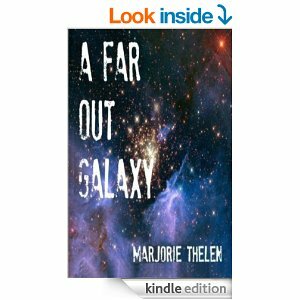 A Far Out Galaxy is a sci fi romance. It is a must have for fans of sci fi and fans of romance. Queen Vita and Commander Will both need heirs. The cloning process has been sabotaged by Commander Will’s step brother, who also wants Queen Vita for his own. Read A Far Out Galaxy today for fun and laughter and the many adventures of the crew of the spaceship Maximum. I absolutely know you will love this book as much as I have. It will keep you on the edge of your seat page after page. This is a must have for sci fi and romance fans alike. I highly recommend this book. Happy Reading! The Coyote Wars is a suspense thriller that will keep the reader intrigued until the very end. The Coyotes are the grown children of a couple that is plotting a home terrorist scheme. I love the way the book tells about each character and their role in the story. I love the build-up of the plot. As the story unfolds you will absolutely not want to put the book down until you have finished reading every page. This is a must have for everyone’s home libraries. I absolutely loved this book and highly recommend it. Happy Reading! For those who love horror stories, you will love Reunion. This is definitely a must have for your home libraries. You will want to read it in one setting. It is exciting page after page and will make you want to sleep with a light on. Reunion: The Making of a Legend is the story about a group of friends who get together in Breaux Bridge, Louisiana for their 10 year high school reunion. They have all been having nightmares over the years of the friend that disappeared the night of the prom. The friends went out to the haunted house to try to see the ghost of the Old Man. They heard insane laughter coming from the darkness and thought it was one of them that was making the laughter. They decided to leave one behind as a prank, when they came back, he was gone. When they gather for their 10 year reunion, a couple of them disappear and they go out to find them. What they walk into is a nightmare in and of itself. 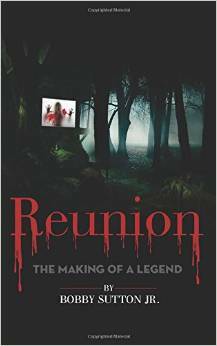 Buy Reunion today and find out what happens to the friends as they embark on a nightmare of an adventure. Absolutely loved this book. Happy Reading. Ride Your Heart Til It Breaks is a very deep and thought provoking love story about the complicated love between a musician and a lawyer. It is written so that the does not get lost when Karen thinks back to the past and her relationship with Stan the musician. Karen began as a lawyer for a firm that had her sit in at a nightclub for a development company that wanted to force the owners out so they could build on the land. When she went there night after night, she developed and relationship and fell in love with Stan the musician and also the couple that owned the night club. Stan had a scarred past that kept him from loving anyone until he met Carrie. Years later Carrie marries a lawyer at the lawfirm she works at and goes by her name of Karen. She eventually becomes a judge and her marraige to Howard has been in name only for years. Then she comes across Stan again, who is, deep down still in love with Karen. Read it today and find out what happens in this love story of the complicated relationship and deep love between Stan and Karen. You will not be able to put it down until you are through. It willl keep you wanting more page after page. I absolutely loved the book!! I give it 5 stars! Happy Reading. holding all the world’s blue waters. But it was also half full of drought. the circling cadence of the waters. and threw it deep into the sea. Sea waters stall the birth of drought. I’ve had enough. I give. brother, to call the goddess of the rain? a listen to the whistle of a train. To hear the rain fall soft again? I’ll give. All I wanted was . . .
Of struggle . . .
With an awakening . 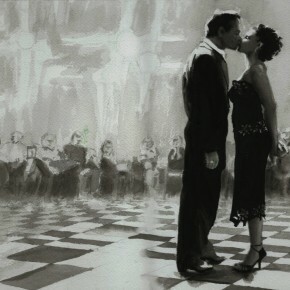 . .
Jordana del Feld is a San Francisco artist and Argentine tango dancer. She paints and dances to connect with the world without and the world within. Her freehand painting technique balances her lifelong training and study of both Eastern and Western art. The dance of the brush records the inner energy of her subjects. 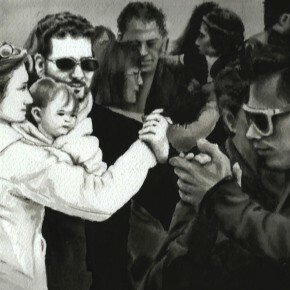 Many people mistake the paintings for photographs, but they show what a photograph cannot. They are the art of the unseen. 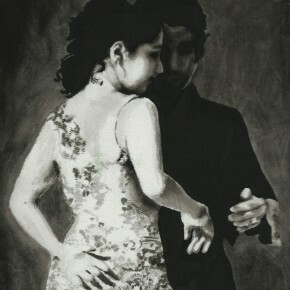 The tango paintings began as a study of light and shadow, positive and negative, motion and stillness, men and women, yin and yang (and all that jazz), but over time, became intimate portraits that told the story of Jordana’s community. 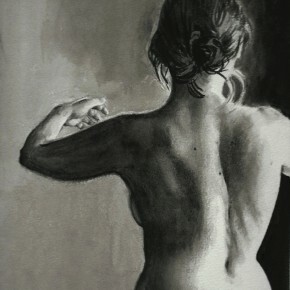 What began as an artistic exercise became confessions from the heart, of the entwined stories of a little world of lovers, friends, hope, heartbreak, joy, sharing, despair, discovery, and above all….